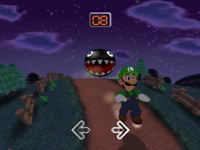 Chain-Chomp Chase is a minigame in Wario's Carnival in Dance Dance Revolution: Mario Mix. A giant Chain Chomp starts chasing Mario or Luigi. The player has to quickly tap left and right alternately on the Dance Pad to run fast enough to escape the Chain Chomp. The Chain-Chomp came out of nowhere! You'd better pick up the pace or he'll catch you! This page was last edited on May 25, 2018, at 18:57.